In the history of human race, science and technology are two things that make great differences from one era to another. Inventions made in those two fields would usually mark a milestone. Since after the World War II, Russia and America have been competing neck to neck in science. One of the most significant points these nations tried to make was to launch their people to the outer space. At that time, only Russia and America had the technology and manpower to accomplish this. Surely it was something that was going to blow the world’s mind after. Russia successfully beat America when their cosmonaut Lt. Yuri Gagarin became the first human to ever go to the outer space and made it going full around the Earth’s orbit on April 12, 1961. He took the flight with a spacecraft named Vostok 1 and completed the mission in 108 minutes. 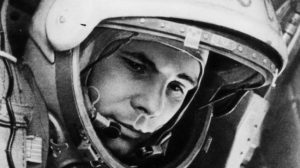 The world then knows him as a Russian hero, but who is Yuri Gagarin actually? Here, in this article, we are going to find out 14 hidden facts of Yuri Gagarin, the first man in outer space. Some of these facts may even be new to you, so read on. Baby Yuri was born on March 9, 1934 in Klushino – a village near Gzhatsk. His father, Alexey Ivanovich Gagarin, was a carpenter and his mother, Anna Timofeyevna Gagarina, was a milkmaid. They worked in a collective farm where they shared the place with many other Russian farmers and workers. Yuri Gagarin was the third of four children and his childhood was not glamorous. Like most people in the Soviet Union at that time, his family also suffered from Nazi’s occupation during the World War II. In 1941 when Nazi occupied their village, the Gagarin’s house was taken away and they had to live in a mud hut sized only 3×3 meters behind the house. The situation lasted for a year and nine months until the occupation was over. Even though life was tough for his family, Yuri was lucky enough because he could pursue his education when they moved to Gzhatsk in 1946. When he was 16, he started to work in a Steel Plant near Moscow as a foundryman. This is the year when his life started to change for the better. He continued going to school by taking evening classes and graduated the next year from both seventh grade and vocational school with excellent grade and honors. This, then, got him selected for training in Saratov Industrial Technical School to study tractors. While he was there, he volunteered on the weekends at a local flying club to train as a Soviet air cadet. That was the first time he learned to fly. The weekend flying club was Yuri Gagarin’s stepping stone to get to more and more trainings and education as a pilot until he received the rank of Senior Lieutenant on November 6, 1959 from the Soviet Air Forces. In 1960, Gagarin was chosen through a tight selection process together with 19 other pilots for the Soviet space program. After further tests and observations, Gagarin was the chosen one to fly the Vostok. He got excellent feedbacks from his trainers also peers, confirmed to possess great personality, intelligence, and physical fitness. Gagarin was a fan of ice hockey and basketball. Yuri Gagarin met his wifeValentina Ivanovna Goryacheva in Orenburg while he was still in school for Air Force Pilot. She was a medical technician. They got married on November 7, 1957 and the marriage gifted them two daughters who then become two of Russia’s important people. Yelena Gagarina is an art historian who also became the Director General of Moscow Kremlin Museums. Galina Yurievna Gagarina is a professor of economics who works for the Plekhanov Russian University of Economics in Moscow. Once after his flight to the outer space, when he had become very famous and toured around the world to promote Russia’s success in the aerospace field, he was caught by his wife being in a room with a woman named Anna who was a nurse that had aided him earlier that day when he got involved in a boat accident. The long and many tours also altered his habit since he had to drink on every occasion and most of the drinks were alcoholic. Yuri Gagarin crossed into outer space together with Vostok 1, the first manned spacecraft in history. The capsule was launched on April 12, 1961 from Baikonur Cosmodrome – a spaceport located in Southern Kazakhstan that was leased to Russia. Gagarin flew as high as 327 kilometers above the earth then went around the Earth’s orbit for 169 kilometers. The whole mission took him 108 minutes right from the time he left the Earth’s surface until back on it again. He didn’t land with Vostok, but got parachuted down after leaving the capsule at 7 kilometers altitude. Yuri Gagarin’s mission with Vostok was the one and only time he went into the space in his lifetime. After that historical moment, he devoted his time to the Soviet Air Forces. On March 27, 1968, when he was on a training flight together with Vladimir Seryogin, their plane crashed near Kirzhach. Both of them died in the accident then their bodies were cremated. The ashes got buried in the walls of the Kremlin on Red Square. The cause of the crash is still a mystery because some opinions say that it was a part of the conspiracy theory to bring Russia down. Those were the 14 hidden facts of Yuri Gagarin, the first man in outer space. Did you learn anything new about the facts surrounding the legendary man? Surely nobody is perfect and neither was Gagarin. But, the mistakes he ever made don’t eliminate the good deeds he had ever done.